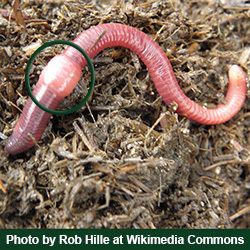 Composting worms will produce nutrient-rich fertilizer for your garden, but you need to feed them right. This is not difficult. Treat these invertebrates like little living creatures – which they are! Worms have likes and dislikes. Putting the right mix of food into your vermicomposting bin helps them do their job: turn trash into treasure. Be sure to cut up the food into small pieces. Pieces should be no larger than 1″ to 2″ at the widest dimension. A food processor or food chopper are handy. These smaller pieces have more surface area and are easier for the worms to eat. Bury the food. This prevents odors, makes the material easy for the worms to find, and discourages pests. Worms also like it if you start feeding in one spot and, at the next feeding, bury the food in a spot next to it. Gradually work your way around the bin. This makes the migration to the new food faster. You should feed the worms a quantity they can eat in approximately 2 to 3 days. Wait until they have made good progress on a feeding before adding more. If you are producing more than they can eat, put the extras in the freezer or refrigerator. Eventually, they may reproduce and be able to handle larger and more frequent feedings. A tray-based composting system is perfect for this, because you can add trays as the population expands (kind of like an apartment building that keeps adding floors). 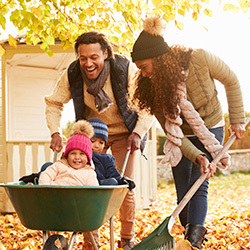 Maybe you have heard about having a mix of “green” and “brown” material for composting. If you are not using worms to break down the compost, this ratio is very important. It helps speed up the rate of composting, and prevents foul odors. The mix is 1 part “green,” fresh, moist plant-based scraps to 3 parts “brown,” dry materials. When you set up your worm bin, you added plenty of brown materials as the worm bedding (shredded paper, coconut coir, pure peat moss, etc.). Whenever you add kitchen scraps, you are adding “green.” Therefore, so long as you don’t over-feed your worms, you don’t need to worry much about this ratio. Every once in a while, you can throw in a handful of egg shells. Rinse them and remove any egg whites stuck to the shell. Then, crush them and stir them into the worm bin. They add grit and calcium, and help moderate the bin’s pH. The care and feeding of vermicomposting worms is not rocket science, but it takes a little discipline. 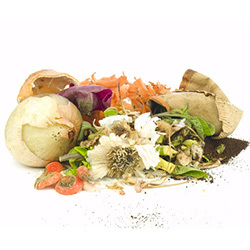 Collect suitable scraps in a container on your kitchen counter or in the refrigerator. Pick out any meat, oils and banana peels. Bury the food in the vermicomposting bin at a pace that matches your worms’ appetite. 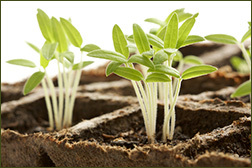 The result will be less waste and plenty of precious “black gold” to fertilize your plants. 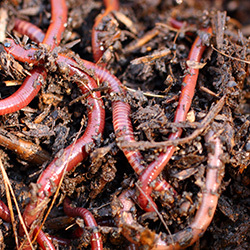 If you want to get started with composting, check out Uncle Jim’s live worms and selection of composters. Great tips! I keep my worms outdoors here in Zone 6. They live in a bottomless box that rests right on the ground. I bought 1000 worms from you guys several years ago and they are still thriving! Two things that also have worked great in my system has been shredded Autumn leaves and dampened cardboard (ripped up into small chunks). I layer browns and greens, focusing on filling the whole box if possible. Since it has no bottom, the juices don’t sit and fester. I can’t harvest worm tea this way, but it is a super easy, amazing way to do it. I simply harvest once a year in the Summer. This year I pulled out 36 gallons of vermicompost!!! I purchased your worms last April. I feed them corn meal, eggs and coffee grinds. The amount of worms kept going down in amount. I had 4 bins, then I divided them into 8 containers, hoping they would grow. I enjoyed watching them, but they are now all gone. I’ve done red worms for 5 yrs or so now nine keep going in a 360 tower but i started in a container w/ holes & lid. when starting a new tray i use raked up leaves is always good n free some coir i have for planting, shredded bills / paper, newspaper stay away from colored & glossy pages egg cartons torn up. Do I have to recycle the soil? I followed you video, but after 3 months the wlrms have all died. I keot them in our garage, where the temperture is nice. What did I do wrong? The peak moss always smelled earthy. Any money back or more wirms? I came to your business to pick up our worns. We live in PA.
About the only thing that will kill your worms as long as you are feeding them, is letting them get too dry. The soil in your worm bed MUST be kept very damp at all times. I have been composting with 7 trays for about three years now, and it is fun. One comment made in this article really surprised me. I have found some foods that the worms just love, and one of them is banana peels. I of course avoid feeding them onions, citrus etc. When I put a banana peel on top of the tray, the next day I will find a huge ball of worms camping out underneath it and it will be eaten rather quickly. Interested in any reply you might have received? I have never seen banana peels as a ‘don’t ‘ feed in your compost? The main problem with banana peels is the worms keep slipping on them this of course is very funny but may cause permanent injury. My worms love banana peels! They eat them up very quickly! You are right – worms love banana peels. Outdoors. If you have an indoor composter, the smell might be overpowering. Enjoy your worm bin! Thanks for your comments, Jim! Actually, banana peels are great outdoors. Some folks like to compost indoors and we find that banana peels are too malodorous. We clarified this in the blog post. My worms also love banana peels. I put all my worm food through the blender before adding it to the bins, and my worms have grown from 1 box to 4. They started to become overrun with mites a while back, but I removed the cardboard, set them in the sun for a few days with the lid off and the problem fixed itself. You recommend no banana peels. Are banana peels bad for worms? Or is it because they just smell bad? Thanks for your very helpful site and prompt shipments. Why no banana peels ? Hi Lee – It’s just the odor. Banana peels are fine outdoors. If someone is composting indoors, the smell of banana peels might be too much. Thanks for your comments! What’s wrong with banana peels? I have several bins now with wigglers and supers, I feed them peels all the time. So I’m curious…never had a problem. Hello James, thanks for your question. Actually, outdoor composters take banana peels just fine. It’s the indoor composters that get pretty smelly when banana peels are added. We have gone back and clarified this in the blog. Thanks for bringing it to our attention! My worms love banana peels more than any other food I give them so why not?? I am also surprised by the no banana peels, I give my worms lots of banana peels, they go crazy for them and I have no problem with any smell. I bought my worm from you 4 years ago and they’re still going strong. Valeria, it’s so great you’ve been keeping your worms happy for 4 years! Yeah, we agree, banana peels are fine outdoors. It’s just the indoor composters that get a powerful odor when banana peels are inside. Thanks for your comments and good going! As an FYI, my worm compost bin is in my basement and I feed the worms once per week. I have, at times, fed them almost solely banana peels and my bin does not stink, so perhaps it is also impacted by the amount of compost left in there and other factors. I divided my worms and now my mom has a healthy population in her basement bin. One question, though. The worms seem to despise her potato peels. I’ve taken to microwaving them first to get them to eat the cooked peels. Usually, though, we just put them in her outdoor bin so the peels won’t sit for months. Can you think of a reason why they would snub potato peels? JT – sorry for the confusion – peels are great outdoors and the worms love them. We should have said they are too stinky for indoor composting. Actually, we went in and updated this in the blog post, thanks to these comments. Enjoy your composting! This newsletter was especially informative: add specific grains; reminder about shredded paper. After four years my 3-tray indoor worm farm is thriving. I collect appropriate foods, stick in the freezer until enough to put through a large food processor, bag in Ziplock, put into freezer. I have a ready supply of food; just thaw overnight and feed. Worm tea is frozen in 8 oz. containers; thawed to use. Although these processes reduce nutrition quality somewhat, the worms thrive; the indoor/outdoor plants thrive on the periodic worm tea fertilizing. I don’t like molds growing indoors, so use this method. Once had black flies from a plant brought into the house. (Coffee ground diet for worms!) Now, I include some grounds in some food bags, egg shells, no flies. BUT, the spigot is leaking! Remove and clean? Replace? Advice, please. I have fed banana peels since day one with no problems at all, although I freeze all my worm food before feeding it to the worms,then I thaw it out and feed it to the worms. My original order of two thousand worm are still going strong after three years. I use a Worm Factory 360 with five trays,I feed all sorts of fruit and vegetable matter,no citrus,onions, or hot peppers. Lewis – thanks for your update. You must be doing something right if your worms have been happily surviving for 3 years! Banana peels are perfect outdoors. The blog post should have said that banana peels are too malodorous indoors. We have gone back in and clarified this. Enjoy your composting! As long as I bury the banana peels as I do with everything that I add to my bins, I have never had a problem with odor even when adding banana peels to indoor bins. The worms love them, and I would take those off of your list of things to avoid. One thing I would add to your list to never add to worm bins is tomatoes… worms will even avoid the green stems from tomatoes which are too acidic. So, why not just cut the banana peels into small pieces, and they will digest them faster? I ordered my worms nearly nineteen months ago. Initially I started with a 50 gallon tote, venilated the top and installed two computer fans in the lid with screens to protect the worms should they get on the inside of the top. The fan helps keep the shredded paper on top dry and has stopped any rogue worms from trying to crawl out. I use about eight (8) inches of machine shredded paper on top of the coconut coir and top soil mixture. Three months ago I switched to Uncle Jim’s Worm Factory and find it much more convenient to operate than the one level bin. I started with 2000 worms and have no idea how many there are now but they appear in softball size clusters around the scoops of food burried in the dirt. I think they have multiplied but have no way to know for sure. I keep the temp at the recommended range (40 – 70 degrees F.) and feed approximately one cup of green/brown mix at a time. This will last three to four days before I add another. I grind the food briefly in a juicer or chop it fine with a Pampered Chef food chopper. That goes for peels, fruit, egg shells, core, vegetables, dry leaves, coffee grounds, etc. Either method works great and there is no food left to mildew or rot. I’ve never had an issue with fruit flies or smells. A very informative booklet comes with the worm factory. I have had my worms for a little over a year now and they haven’t stopped multiplying since I’ve gotten them. There is constantly eggs everywhere in my bins. Guess I’m doing something right! My worms also love banana peels. I do bury them in the bins. My bins are indoors in my basement but there is no smell when I feed banana peels. Love my worms! READ; Banana peels are ok. Move on! I am a newer “worm grower”. I have a worm factory and have a happy farm, seems to be going well. I bought a 1000 worms to start, half red wiglers and half night crawlers. I’m raising the nightcrawlers for fishing with but after three months I can barely tell that they’ve gotten any larger then when I start it. They were the same size as the red wigglers about 2 inches long and skinny. They seem to be about the same size 3 months later. Is this normal and at what point TimeWise should I expect them to be large enough to use for fishing bait on the hook??? My second question is that I was told that coffee grounds stunt the growth of worms. I was told that they do love them but if I wanted to see larger worms, to cut out the coffee grounds. Is there any truth to that ??? i purchased some red wigglers from you and was wondering if they could be raised in a raised garden bed about 12 inches in height with a screen mesh pn the bottom to prevent moles from coming up into the raised bed. the raised bed would b used to grow a garden; would be 4ft wide 8ft long and 12in deep. My worm farm 360 is getting HOT! It sits on the basement floor and the temp down there is 65 degrees. But I notice the center being too worm so I stuck in the thermometer and to my surprise it was 90 degrees down in the center. What I am doing is freezing blocks of aluminum and swapping them in and out. Some worms did crawl along side the aluminum to cool off but I know this is only a temporary solution. My guess is I am feeding them too much and it is rotting. I did get it too wet for a while, I dug out some of the center but this system is only 6 weeks old starting with 2000 worms. If your compost bin is getting too hot, one easy method for cooling it down is freezing your compost materials (food scraps) and putting them in your composter. This will help with the heat and it also breaks down the food faster. My tray was getting very warm also when I first set it up with the coconut coir. After 3 months I have moved them into newspaper, leaves and some cardboard which seems to stay wet longer than the coir. My worms are in the garage where it is very hot in the summer. I switch out frozen gel packs and water bottles 3 times a day. I also on occasion try and fluff up the bedding but I have found the wet paper does not get hot. I also freeze cut up food along with banana and the peels. All food is buried under the paper in the center of the top tray. I bought my worm’s from uncle Jim’s in July 2014 , I started with 2000 red wiggler’s and in August of 2014 I bought another 5000 more and 30 cup’s of night crawler’s around 750 worm’s and they are doing great . I feed them kitchen scrap’s , shredded paper , grass clipping’s , horse manor , pine shaving’s , and corn meal and some grown egg shell’s and they love it all. I have 5 smaller ben’s 7 feet x 3 feet and 3 larger ben’s 4 feet x 80 feet and fixen to expand . Thank you Uncle Jim this has been a great business so far for my family to start . We love reading every thing you post on worm’s and every thing we can find to improve our worm ranch , looking for word to talking to you soon . Hi. I am wondering about feeding over ripe avocados. Is this considered an OIL? Your mix of red worms, has been very effective in my compost of home scraps. I sometimes dehydrate banana peels, sometimes freeze and defrost, several times. ground egg shells, coffee grounds… oatmeal, spoilt veggies… I did cut up a over ripe pineapple and over some time… they are consuming this too. I use frozen in ice cube trays, veggie mush, liquid from watermelon… it last in freezer forever. I use a 30″X 24″ X 24″ high opaque tub. no lid.. small 1/16″ drain holes. The 2000 worms you have sent to me I am sure have doubled. when I harvest I sift out the eggs and keep in a container with compost until new worms emerge and then place them into bin. Happy! Happy! Hello! I think adding over ripe avocados will be no issue at all to a worm compost bin. Glad to hear your worm farm is going strong! I have a medium tote with air holes cut into it. I started with the usual mix of newspaper, peat, shredded cardboard, autumn leaves, and shredded paper. I put in 500 warms purchased from you. They love coffee grounds, egg shells and especially avacado. They have been going strong for almost a year with no problem. Recently I put in a couple chopped up bell pepper scraps and the tops of 2 onions. This may have put them over the edge because a few have been trying to escape! I never had this issue before. There is a good 1/2 inch of “black soil” now at the bottom of the bin. Funny because there was no soil added. Do you think it is time to harvest or should I move them to a larger bin? Why are they unhappy? I am just getting started with vermicomposting. One question I have not found an answer to is how much compost will be created by my worms. I did not know if there is a ratio per pound of food consumed to compost created. Thank you!! I have had my worms for 6 months now, and the 1000 starting population has surely quadrupled at least. The first harvest I did was after 3 months, and I am due for a second harvest. I use the 360 system, and harvest from the bottom tray. One tray contains about 40 pounds, and can mostly fill a 5 gallon pail. You shouldn’t leave the lid on the harvest, as it could go anerobic, which would ruin it – not to mention the smell. I keep the lid slightly adjar, and once in a while, I rotate the pail to keep the soil nice and loose. It’s kind of funny, once in a while, when I use the soil for house plants, I will see some worms still living in the compost. Must be some nutrition left for them to eat. This week, I will start a new top tray, and next week, I will harvest from the bottom. What do you do when you go on vacation for 7 to 10 days to keep the worms alive and well? Before leaving for a certain amount of days, you will want to ensure that your worm bin is at the correct moisture level so that the bedding does not get too dry while you are away. We like to compare the correct moisture level of the bedding to a wrung-out sponge, that when squeezed only emits a drop or two of water. Also, you want to add enough food to the worm bin to keep the worms fed for the time you are away. I am a new wormer and an old organic gardener. My worms from uncle Jim’s are active and eating well, though how much to feed and figuring out when it gets eaten is still being worked out. I found that they LOVE leftover cooked rolled oats – they all congregate to feed at once. Gotta say, I really enjoy the worms, aside from the gift of compost, my interest has been captured by their antics. I have been composting for over 20 years. First with no worms. I had no knowledge of worm composting. Now I have composters outside and in my basement. First time ever my newest addition has turned blue!! What is that? Mold? It is actually a pretty blue. But no one wants blue in their compost .What do I need to do? What should I have not done to cause this?There are many, many worms and a lot are on the top. Does this mean they are trying to get out? Thank you. I really enjoy your newsletters. Could some one please reply to My comment on 3/22. The blue stuff has now gotten hard. I have a lot, I mean a real lot of worms in my basement and do not want to loose them, now that they will be going out side shortly. Please help! Fungal growth in the worm bin is not surprising since the environment is perfect for the growth of mold spores, etc. Several things could be causing the mold in your bin. 1) Adding excess food that makes the moisture level higher and 2) raises the pH in your bin. The growth of mold is highly favored by acidic conditions. However, mold in your worm bin is not the end of the world. In order to help balance out the pH level, you may want to add some crushed eggs shells. Hopefully this will help! all of it became a powdery substance, my question is will the rice OK?? I am trying the dry worm food as I have seen videos of some people who do only dry grains and ground shells – oyster or eggs etc. My worms seem to be going crazy over it. I mist it with water first. I cover that with shredded newspapers. I use a paper shredder. They are multiplying like crazy and I only purchased 500 reds about a week ago. What is the reason for giving the worms your meal food (the stuff that you sell by the bag)? I haven’t seen any descriptions or discussion of how, when and why to use it. Hi, just found this site and I love it. I started raising worms quite by accident. I live in a condo with limited space, so I used a large black pot that a tree came in to start some compost. The worms found their way in through the drainage holes at the bottom of the pot and suddenly I found an entire nursery of baby worms in my compost pot. My worms come and go as they please, and I move my pot around my rose bed from time to time. I use mostly coffee grounds, egg shells, banana peels and some other kitchen waste such as melon rinds. But I have learned so much from this site and plan to really up my game this spring and summer – thank you so much!!! My red Wiggler’s love tomatoes. I don’t know why they’re on the “don’t feed” list. The only problem is the seeds remain viable and I get tons of volunteers when I add the compost to my pots. I got 1000 worms three years ago and they’ve going strong in two Rubbermaid totes. Anybody ever have a fruit fly invasion (the banana peels can cause this, I heard)? If so, what were you able to do to subdue it? I’ve just purchased 250 nightcrawlers for fishing and my first concern is how to keep the peat moss damp enough without disturbing the worms. I have them in a dark tub with a lid with about a dozen small holes in the lid. I made sure the peat moss was sufficiently moist according to the directions from your website. Currently they are kept in the garage and on the third day after they arrived, I added some corn meal, coffee grounds and damp newspaper on the top of the soil. I’d like to know about how much food to give them weekly and how to best maintain moisture of the soil. Thanks. I just found this site I enjoy reading all the posts ,I am new at this so I need all the imformation I can get I want to use plastic containers stackable can onyone tell me where I can get the imformation on how to set up the bins drilling the holes etc. Thanks you . I have had a vermicomposting set-up on the ground for about 20 years with many years of happy worms. Last year, gophers started to invade and worms are disappearing!! I’m devastated! Do gophers eat worms or are they just after the scraps and the worms are innocent victims???? I have a big family of very happy worms in a tower-style bin under my kitchen sink. The compost in the bottom tier is close to ready and I would like to start using it for compost teas, but there are still lots of worms and eggs in the bottom tier. I would like to bait the worms out of the soil by using some sort of desirable material. I know manure is the best bait for composting worms (I did this when I worked on a permaculture farm), but I don’t have access to manure. Do you know of any foodstuff that worms find irresistible that I can use to bait them out of the compost? Thank you!